Day 12: Theres been a chocolastrophe! There are no good words for the crazy-ness of the shop at 8.30pm on the first night we should have fully and properly off, but somehow, Jesus found some. so, over to him. Tim Dion, our new best friend and fin shaper extraordinaire, told us this on one of his visits. The boards that we are making, well, the design harks back to the first paddle boards to be paddled in open water, the fins reflect two distinct designs and periods in the history of surfing, and the shield design that we put on this weekend is reminiscent of shield designs from way back when too. and yes, we blatantly stole our ideas from the great designs of the early days of surfing and paddling, with some guidance from our friends out here, and we are hopeful that the surfing and paddling community will embrace our ‘handcrafted in Malibu’ boards with all the love and care that we, collectively, have put into making them. things are winding down here, yet they are also stepping up a notch- we’re putting on all our finishing touches, lacquer, epoxy, finish sanding, sugar coat, and that all involves a lot of waiting and drying, but at the same time, everyone here is getting pumped for this to be finished and for the boards to be launched, to actually get out and paddle them. to test their seaworthyness. Our logo and grip shield pattern went on the deck. A deep walnut stain works incredibly well to brighten up a specific area on these boards. The edge was then be outlined with a little household latex, which seemed to just place itself in a perfect curve around the pattern. Next we faired all of the frames and stringers that shape the board from the interior. Running a straight edge across the top of the board is a quick and painless way to find your hills and valleys and fix them up. Once the tops of the frames, stringers and sheer were all fair and ready, a generous heap of glue consistency resin mix was applied to all of those edges to receive the deck; a simple two man (or woman) job. Since the deck was cut exactly for the shape for the hull, setting it atop the hull assembly is as easy as putting the lid on a tupperware. Ok.. here’s what’s really happened. Our logo and grip shield pattern did in fact go on the deck. 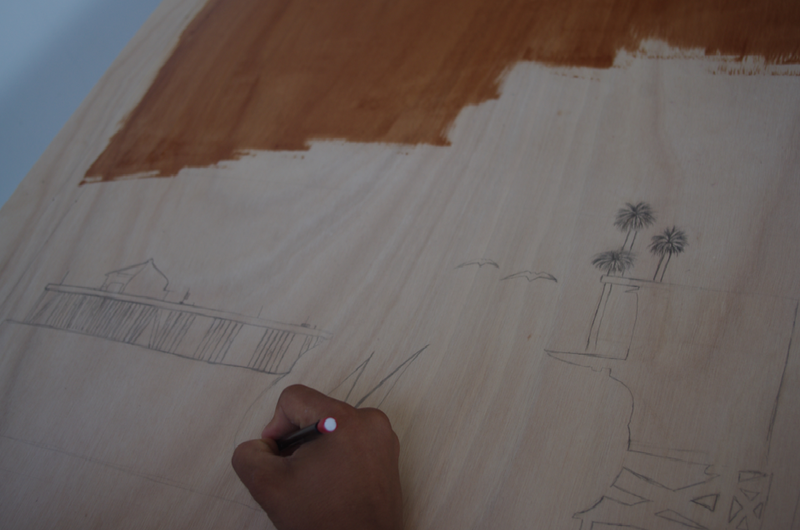 However.. do you know how hard it is to hand draw a duplicate logo (quite large, in fact) on two different boards? I don’t either, but Luis didn’t seem all too thrilled about it. As for the stain.. a minwax walnut would have been delightful, but budgetary restrictions birthed a mean creativity within us. After trials of coffee stain (with and without cream), powerade, and pepsi, we decided to go with a lovely stain made from equal parts pepsi one and hershey’s syrup. It looks like ebony and smells like a sundae. Yet.. chocolate doesn’t quite dry the way proper stain does. So? We’ve had to “re-texture” this deck design several times to use chocolate’s natural glossyness to add depth to our wood grain as opposed to letting it just puddle and shine like melted kisses. The edge line, you ask? It was ok. I think MPC’s Mike Morgan almost had aneurysm from trying to paint in a fair curve.. which he described as the definition of stress.. pretty significant coming from a youth programs director. Then, we faired everything. It was horrendous. The kids couldn’t quite grasp the idea that if you hold a sander to a surface and then start a conversation with your friend about the awesomeness of goldfish crackers, you WILL gouge the surface… which means the rest of the lines now have to be brought down to that height. Wonderful indeed. Finally.. we glued the deck. Did I mention we ran out of thickener for the epoxy? No? Well maybe I didn’t mention it because I bought double what the plans called for… the kids must’ve been eating it. So we scooped handfuls of wood dust and plane scraps off of the floor/tables/cabinets/sawhorses/tools/shirts to create a lovely wood glue resemblant of three month of clam chowder. Incredible. Yet, as always, it worked. Everything worked. Even using a heap of bibles to weigh down the deck onto one of the hulls when we ran out of cinder blocks worked. That’s the beauty of wooden boats.. they go with it. They let you give a little here and take a little there without much of a fuss. Beautiful. Urban BoatWorks in Malibu: Day 8, Hula Pie? today was a day of learning curves. luis in the waves with a surfboard. jesus in the shop learning to place fins. mike in the van planning a steep teaching curve. me learning to let go a little, use the math that was hammered into me, accept peoples generousity. we all had to learn to let go of our schedule, to lean a little more on each other and those around us, and to be grace-filled people. it’s definitely getting to that point, that breaking point, that exhaustion, running on pure adrenaline, haven’t had enough time off point and so the little things get big and the big things…. phew. but the end is in sight. this week, after the weekend, will be a delight. the deck design is almost ready, the fins are in place, the boards are readying themselves for their unveiling. my goodness things are shaping up around here, and the conversations? well, they just make me laugh. and want to bring all these people back to camden. the things we could do. the ideas, the energy… it is marvellous. hopefully we’ll catch some more of that and you’ll get to experience it too. until then you’ll have to make do with my witterings. Tim Dion, a professional surfboard shaper here in Malibu stopped by the shop today to check out what we were doing. Within minutes we had forgotten about the cups of epoxy curing in our hands as surfer wisdom poured out of his mouth. As it turns out, what we do in Camden and what we are doing here in Malibu are much more similar than ever realized. The area Camden now resides in began as prime waterfowl hunting and fishing grounds for the lenape people who would earn their keep on birch bark canoes. European immigrants (dutch, most likely) fell for the land for the same reasons and began imitating and re-imagining these double ended vessels to include sails, rowing and poling stations, birthing boats like the ducker, tuckup and railbird skiffs. As industry began to run our cities, Camden became a workingman’s mecca.. but not for railroads or automobiles… for boats (and phonographs and soup, of course). Ships would roll off of the New York Shipbuilding Corp. lines in south Camden to discover the unknown, map the uncharted, and devastate the non-compliant (sadly indeed). All of these make me think that Camden has something to it… something greater than mere water access that causes people to build boats and fall for the rivers… as if the land itself yearns for it. Perhaps now it simply longs for a return to a home it once new.. the kind that was felt at the most recent boat launch on the Cooper River as 15 kids bounced toothy smiles off the most subtle wind swells. Malibu shares in Camden’s longing. Rumor has it that Malibu created surfing as we know it by being the first wave where someone turned down the face as opposed to simply riding towards shore. I believe it.. and if you were here, you would too. Surfrider beach (or Malibu Point as it was called during Malibu’s golden age of surfing beginning in the mid 20′s) has been credited with being the wave that has had the most effect on surfing’s popular image… that long, perfect, glistening tube… visible from miles up Malibu Canyon Road. Tom Blake’s legendary board (especially SUP) designs were built in driveways and garages all around this area through the thirties, forties, fifties and sixties until Malibu shifted gears. Once a wilderness for the redwood paddling adventurer, Malibu became a retreat community for those lucky few who could afford it. Though surfing is still huge here, we can feel that what we are doing here is something greater, something more important. It’s pulsing through the group of builders, growing in both numbers and excitement daily, and keeps us feeling as if we stumbled onto a goldmine. It seems that we Urban BoatWorkers, apprentices of the very boat that chooses us to build it, are once again in over our heads trying to reconcile a culture and a people to it’s land and it’s history… and I think it’s working. This weekend we will sign our name on the board’s deck, not for vanity but for bookkeeping. These kids are making history in their city and 75 years from now when most of us are long gone these old school paddleboards may well live on adorning the wall of a themed local eatery or small gallery to forever tell the story of a bunch of wild locals who decided to go against the grain of their culture and honor, commemorate, their home.